Like many families, in my house we share gifts of chocolate eggs to celebrate Easter. We all know that eating chocolate can be comforting and relaxing – often because we eat it in calming or enjoyable environments, such as at home after work, at the movies, or at Easter with loved ones. But what effect does the smell of chocolate have on us? To me, chocolate smells warm, sweet, nutty, buttery, caramel, with earthy undertones and sometimes roasted meat or coffee notes. 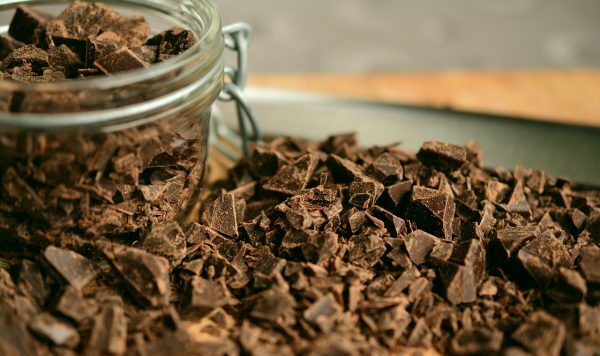 But with around 600 individual flavour compounds, the smell of chocolate is a unique combination which means it can smell very different to different people. I find it fascinating that a group of powerful and pungent compounds called pyrazines, which are present in asparagus, tobacco and fish, are also responsible for some of the typical notes in chocolate. I have even noticed notes of chocolate in Thai fish paste when cooking! One thing that researchers can agree on is the effect of chocolate’s smell on the brain. Neil Martin of the Human Olfaction Laboratory at Middlesex University, assessed the impact of different odours (including chocolate) on mood. “The aim was to compare the effects of pleasant and unpleasant ambient odours on stress, anxiety, depression and mood”, Martin explains. “So far it seems that the smell of chocolate really does make people less stressed and anxious, and more relaxed”. So what does this mean for those that want to harness the smell of chocolate? There have already been reports of shops using the powerful scent of chocolate to subtly waft into their stores, to make customers more relaxed – encouraging them to spend longer in store and to open their purses. In the perfume world, gourmand fragrances (those that are centred on notes of sweet and edible ingredients such as vanilla, chocolate and candy floss) have become increasingly popular over the last few decades. It’s no surprise that these scents are popular, since many people have such happy childhood memories associated with these sweet ingredients. My prediction is that the use of food and drink ingredients in perfume will grow over the coming years – we have already seen some more coffee notes being used. If you like the smell of chocolate so much that you’re wondering how it could smell in a fragrance, of course the most famous and obvious place to start is Angel by Thierry Mugler (1992). This fragrance was one of the first to use a chocolate note. Another more recent fragrance a little more off the beaten track is Orchidee Vanille by Van Cleef & Arpels (perfumer Randa Hammami, 2009), which combines sweet vanilla and chocolate notes to great effect. Or for something a little bit more accessible – the Lynx (Axe) Dark Temptation deodorant (scent created by Ann Gottlieb) is unmistakably sweet and chocolate-y. This was an unusual direction for a deodorant so it is worth trying if you have the chance.